While you can improve your chances of winning if you study and practice games like blackjack, there’s nothing you can do to improve your chances at slot games. Behind the reels, there is a Random Number Generator (RNG) that determines the outcome of the game. At the name of the generator suggests, each spin of the machine is completely independent. For this reason, it doesn’t matter if you play one machine for an hour or ten different machines for 6 minutes each. Your chances of winning are going to stay the same. There is no pattern and there is no cycle that repeats itself after the machine runs its course. Every set of numbers is new, random, and independent from the previous numbers. Although the algorithm is random, it does have some parameters that casinos can change depending on the machine. For example, even though the reels appear to have twenty symbols per reel, in reality, the algorithm goes through many more combinations than that. This option allows casinos to create bigger jackpots, that all casino goers love so much, but it also allows the casino to change the odds, or payback amounts, for each machine. This means that two machines can be located next to each other on a casino floor and look absolutely identical on the outside, but the chances of winning are going to be completely different because the engineers programmed the machines differently. This does not mean that the casino can change payouts and chances of winning at will any time it wants to. There is no magic button or switch that allows casino administrators change the odds depending on who is playing the machine. 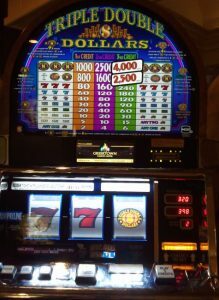 Reprogramming a machine is a lot of work and requires many levels of approvals and paperwork, which is why such adjustments happen very rarely when machines get to the floor of the casino. Typically, the manufacturer sets all the parameters before a machine gets to a casino and the parameters do not change after that.